Lactate dhydrogenase, with NAD in red. Lactate dehydrogenase is a safety valve in our pipeline of energy production. Most of the time, our cells break down glucose completely, releasing the carbon atoms as carbon dioxide and the hydrogen atoms as water. This requires a lot of oxygen. If the flow of oxygen is not sufficient, however, the pipeline of energy production gets stopped up at the end of glycolysis. Lactate dehydrogenase is the way that cells solve this problem, at least temporarily. When we exercise at a normal pace, our cells get plenty of oxygen and sugar is broken down quickly and efficiently. However, during sprints or other over-exertions, there isn't enough oxygen to go around. In this case, our cells use glycolysis as their primary source of energy, As part of glycolysis, hydrogen from glucose is placed on NAD+ to form NADH. Normally, these hydrogen atoms are then transferred to oxygen to form water. If oxygen isn't available, the NADH builds up and there isn't enough NAD+ to continue using glycolysis to make ATP. That's where lactate dehydrogenase steps in: it combines pyruvate and NADH, producing lactic acid and NAD+. The NAD+ can then be recycled to do another round of glycolysis, quickly producing more energy for the sprint. However, lactic acid builds up and in a matter of a minute or so, you have to stop and let your body recover. As you catch your breath, your body converts the lactic acid back to pyruvate, where it enters your normal flow of aerobic energy production. Our cells build two major types of lactate dehydrogenase: the M form and the H form (there is also a third form that is only made in sperm). These are very similar in size and shape, but they have different catalytic properties. The M form, which is the major form in your large skeletal muscles, is best at converting pyruvate to lactate. It stands ready to get to work if the muscles need to perform anaerobic exercise. The H form, on the other hand, is better at the opposite reaction, converting lactate to pyruvate. It is the major form in the heart, which has a constant supply of oxygen and can easily use lactate as an aerobic source of energy. The two types are so similar in structure that they form complexes with a mixture of both types, for instance, with two H chains and two M chains. In this way, different cells can tailor their lactate dehydrogenases to fit their current needs. 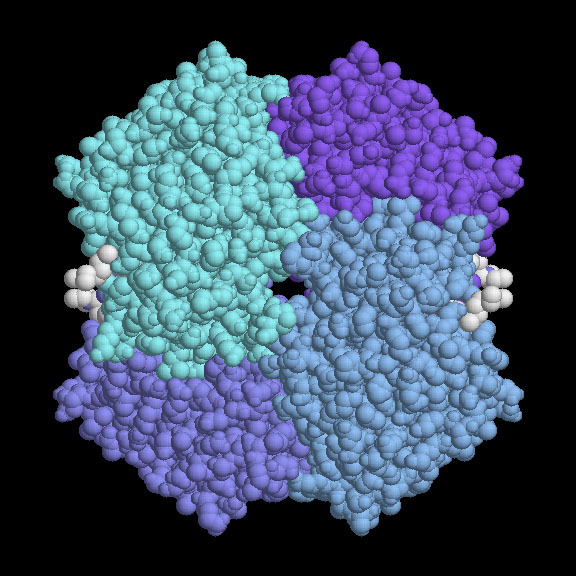 The molecule shown here, from PDB entry 3ldh , is the form with four identical M chains. Active (left) and inactive (right) lactate dehydrogenase. Some bacteria obtain most of their energy by conversion of glucose into lactose. This process is called fermentation, and you have probably experienced the results of it at the dinner table. Fermenting bacteria are used to convert milk into yogurt and fermented lactic acid is an important part of the sharp flavors of sauerkraut and sourdough bread. 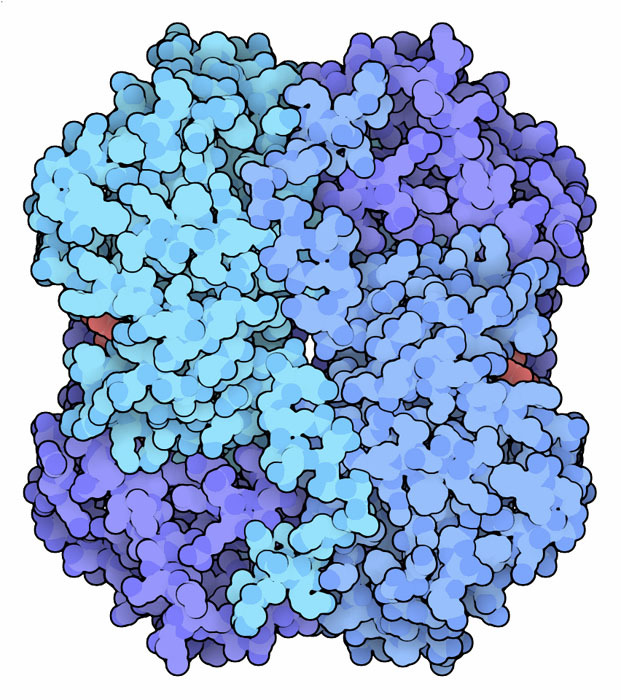 The bacterial lactose dehydrogenase shown here is an allosteric enzyme. Binding of fructose 1,6-bisphosphate, one of the molecules formed in the early steps of glycolysis, causes the enzyme to change into an active shape. Remarkably, PDB entry 1lth , shown here, contains two separate enzyme molecules, one in the active state (left) and one in the inactive state (right). The protozoan parasites that cause malaria are thought to rely on glycolysis for most of their energy during part of their cycle of infection. Researchers are now looking for drugs to block the action of lactate dehydrogenase as a way of attacking these parasites and curing the infection. The structure shown here (PDB entry 1cet ) has four molecules of chloroquine bound in the active sites of the lactate dehydrogenase found in the Plasmodium parasite. Chloroquine is one of the major drugs used to treat malaria, however, its major site of action probably isn't at this enzyme; instead, it is thought to block the unusual methods that the parasite must use to feed on blood. But researchers are exploring many other anti-malarial molecules that target lactate dehydrogenase, as seen in other PDB entries such as 1t24 , 1t25 , and similar structures. To explore this structure in more detail, click on the image for an interactive JSmol. D. L. Nelson and M. M. Cox (2000) Lehninger Principles of Biochemistry. Worth Publishers. M. T. Madigan, J. M. Martinko and J. Parker (2000) Brock Biology of Microorganisms. Prentice Hall. J. A. Read, K. W. Wilkinson, R. Tranter, R. B. 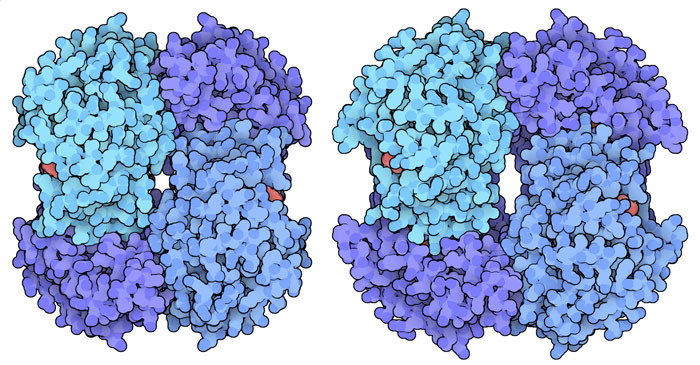 Sessions and R. L. Brady (1999) Chloroquine binds in the cofactor binding site of Plasmodium falciparum lactate dehydrogenase. Journal of Biological Chemistry 274, 10213-10218. S. Iwata, K. Kamata, S. Yoshida, T. Minowa and T. Ohta (1994) T and R states in the crystals of bacterial L-lactate dehydrogenase reveal the mechanism for allosteric control. Structure 1, 176-185. J. J. Holbrook, A. Liljas, S. J. Steindel and M. G. Rossman (1975) Lactate Dehydrogenase. In "The Enzymes," P. D. Boyer, editor. Academic Press. Volume XI, pages 191-292.